This GPS based vehicle tracking system based on the Arduino using GPS and global system for mobile communication. This is a two-way GPS communication system wherein communication is done in both ways with GPS satellites. 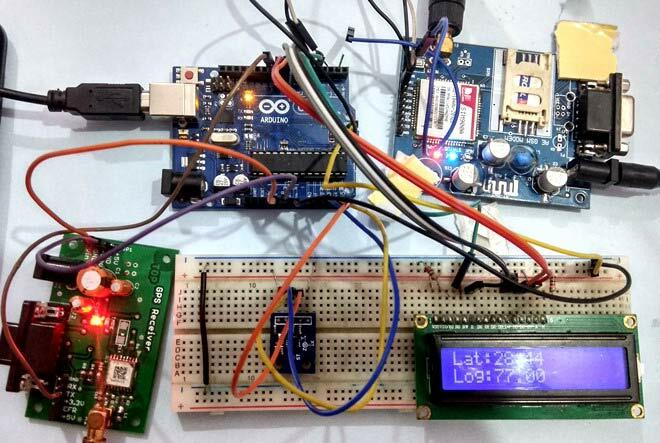 This project uses only one GPS device and two-way communication is achieved using a GSM modem. GSM modem with a SIM card used here implements the same communication technique as in a regular cellphone. The system can be mounted in your vehicle in a hidden or suitable compartment. After this installation, you can easily track your vehicle using your mobile phone by dialing the mobile number of the SIM attached to the GSM modem. When you want then you will get the location of the vehicle in the form of an SMS on your mobile phone. GPS modules typically put out a series of standard strings of information, under something called the National Marine Electronics Association (NMEA) protocol. Arduino/Genuino Uno is a microcontroller board based on the ATmega328P (datasheet). It has 14 digital input/output pins (of which 6 can be used as PWM outputs), 6 analog inputs, a 16 MHz quartz crystal, a USB connection, a power jack, an ICSP header and a reset button. Figure is given below. Circuit Diagram of this project is given below. You can locate your stolen vehicle easily using your mobile (GSM). It can be used for trucks carrying valuable goods, to keep track of the status of delivery and location of the truck at all times. You can easily install it in any vehicle such as cars, boats and motorbikes. An SMS will inform your vehicle position.